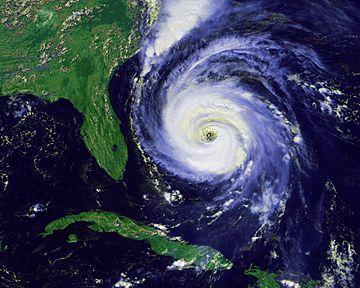 Hurricane Fran was a hurricane during the 1996 Atlantic hurricane season. This storm caused over $3 billion in damage. It killed 20-30 people. 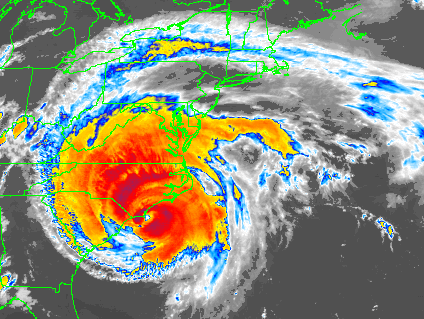 Fran struck North Carolina as a strong Category 3 hurricane with winds of 115 miles per hour (185 km/h). The name Fran was later retired and replaced by Fay for the 2002 Atlantic season. Hurricane Fran started from a tropical wave that moved off the western coast of Africa, entering the Atlantic Ocean, on August 22. The low pressure area became a tropical depression on August 23. Little changed for several days. By August 26, the storm had been disorganized. 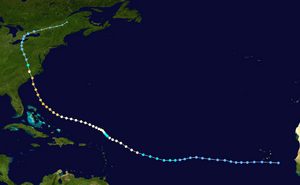 On August 27, the storm grew into a tropical storm and was named Fran. 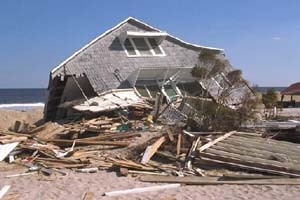 On August 29, the storm intensified into a category 1 hurricane. The interaction with Hurricane Edouard led to weakening and the storm took a northwestward direction. 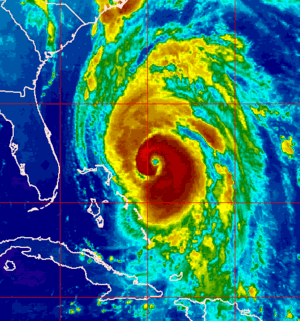 When Edouard was gone, the storm grew into a category 1 hurricane again. Fran grew in early September. By September 3, it the winds were at 90 miles per hour (140 km/h). The system started to develop an eye. By September 5, winds were at 120 mph (195 km/h) and its pressure was 946 mbar. On September 6, the storm hit North Carolina with winds of 115 miles per hour (185 km/h). Once on land, the storm rapidly weakened. It moved through Virginia. It died on September 8. Hurricane watch was issued in the Lesser Antilles on late August. As Fran moved away, the watch was discontinued. Hurricane Fran Facts for Kids. Kiddle Encyclopedia.